Fields are still needed to help with the study for 2019. 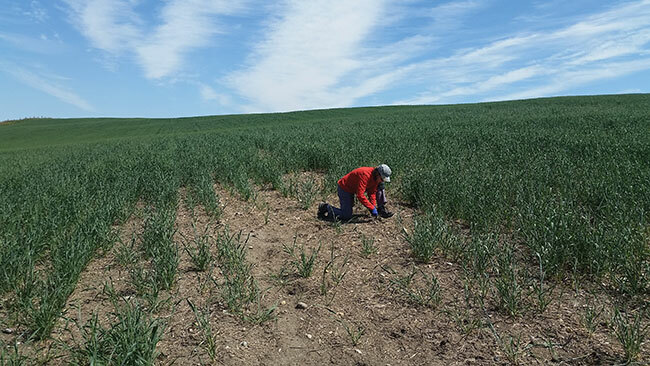 Haley Catton digging for wireworms in a dead patch in an infested field.Photo courtesy of Mariah Ediger, AAFC Lethbridge. Alberta’s most ambitious wireworm management research project will enter its third year in 2019. Haley Catton, a research scientist specializing in cereal crop entomology at the Agriculture and Agri-Food Canada (AAFC) Lethbridge Research and Development Centre, is the project’s principle investigator. The multi-year project is co-funded by the Western Grains Research Foundation and the Alberta Wheat Commission with in-kind contributions from AAFC, and brings together collaborators from across Canada, including Kevin Floate and Hector Carcamo at AAFC Lethbridge, Wim Van Herk and Bob Vernon at AAFC Agassiz in British Columbia and Christine Noronha, an AAFC wireworm specialist in P.E.I., as well as Alberta’s provincial entomologist, Scott Meers, and AAFC Saskatoon’s Erl Svendsen. Wireworm is the larval stage of the adult click beetle; the pest is difficult to control, partly due to the fact that its life cycle is so long—larvae can live in the soil for up to 11 years. In Alberta, damage to cereals ranges between one and 50 per cent annually, according to the provincial agriculture website. In recent years, following the deregistration of key chemical controls, wireworm has emerged as an economically important pest of cereals and horticultural crops. But wireworm has been a pest on the Prairies since producers began growing cereals, Catton says. Research on control mechanisms for the pest actually began sometime in the 1920s before it “trailed off” in the 1970s, when pesticides registered against wireworm became available. Catton’s research program is focused on cereal crop entomology, and she is especially interested in studying both pests and beneficial insects in crop fields. It has four main objectives, according to Catton. Because it isn’t known how female beetles decide where to lay their eggs, or how wireworms select crops to feed on, the first objective is to study the effect of past rotations on current population structures of wireworm in the field. The second objective of the study is to compare a variety of traps for collecting wireworms and beneficial insects to aid monitoring. 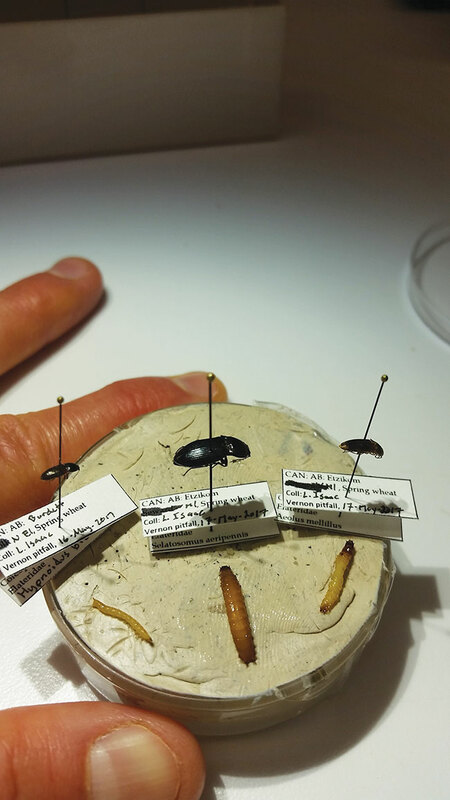 A third objective is to use advanced techniques to analyze the gut content of predacious beetles for wireworm DNA. This method has been used for other insects but never wireworm, says Catton, and could help researchers decide which beneficial insects offer natural controls against the pest. The project’s final objective is to synthesize all of the project’s findings into a wireworm field guide for Alberta. Digging for wireworms in a wireworm-damaged field near Pincher Creek in 2017. Photo courtesy of Haley Catton. Three of the main wireworm pest species on the Prairies in their adult and larval forms. Photo courtesy of Haley Catton. 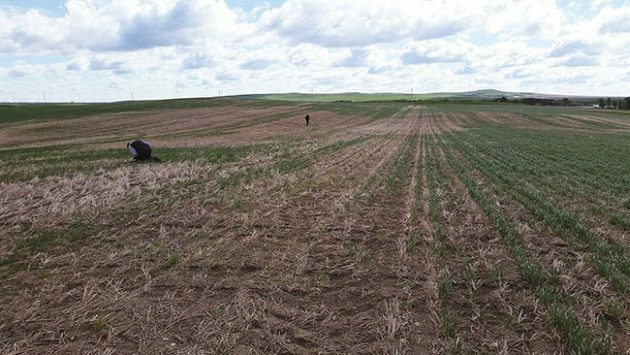 Each year, 12 commercial spring wheat fields are chosen for intense sampling. Field studies began in 2017 and will wrap up after the 2019 season. Once selected, fields are visited weekly between pre-seeding and harvest so researchers can collect 12 soil cores (for wireworm sampling) and six pitfall traps (for adult click beetle and beneficial insect sampling) from each. “In 2017 and 2018 we took almost 2,000 soil samples each year and found 507 and 335 wireworms respectively,” Catton says. “So far we have confirmed previous reports that wireworms are very patchy. In 2017, 58 per cent of the wireworms we caught came from just four out of our 12 fields, and in 2018, 41 per cent of wireworms came from two out of 12 fields. “We still have a lot of data to collect and analyze, so maybe we will find some patterns once it is all said and done, but why some fields have lots of wireworms, while the field next door may have only a few, is a mystery so far,” she says. Catton and her colleagues are currently looking for farmers with eligible fields to volunteer for the study in 2019. To be eligible, fields must meet specific criteria: they must be located within a 90-minute drive of Lethbridge, they must be planted to spring wheat, have a wireworm problem, and have had rotations of cereal-cereal, cereal-canola, canola-cereal or pulse-canola in 2017 and 2018. Interested producers should contact Catton at 403-317-3404 or haley.catton@canada.ca.